Monday 22nd of August 2011. Day 1 Sheffield to Eastwood. We went out with the bat detector last night round the lock flight at Tinsley. Good numbers of Pipistrelles and Daubentons were detected. I took a flash light and we were able to watch the Daubentons skimming insects off the water surface. We were booked to descend the flight at 9:00 and we were under way bang on time. The cruise for us always starts out with a visit from the marina to the canal basin at Sheffield for a pump out. We then retrace our steps back to the marina. We failed to do this on our Easter cruise this year. You can read the results of that oversight here. Passage down the eleven locks of the Tinsley Flight is always the start and finishing line for our trips out on Rosie. We like Tinsley marina and think that the number of locks is a small price to pay for the facilities that Tinsley offers. Today with lock keeper Derek and in company with another boat we passed down the flight without problem. This is a good omen for the rest of our extended trip. Our previous passage was something of a disaster which you can read here. We shared the locks with Nb Joanne which made the passage easier as we shared the work. We don't have a tight schedule, in fact we don't have any schedule at all. This is because we don't have a destination in mind, we are going to just go with the flow so to speak. We have about 50 days before we have to bring Rosie back to her moorings for the winter. Part way down the Tinsley Flight of locks we pass under the Tinsley (Double Decker) Viaduct which carries the M1 motorway on the top deck and a local road on the lower deck. On the left you will see the Meadowhall shopping complex. 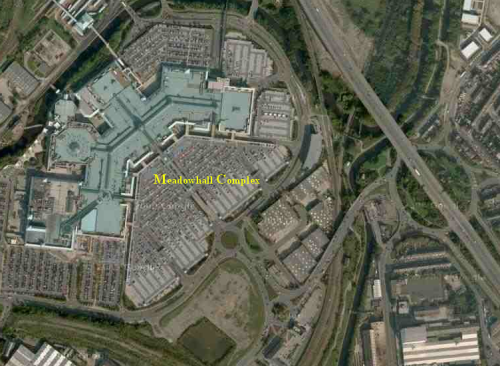 Known to all the locals as the Meadowhell complex because of all the traffic congestion it creates. We were soon down the flight and through Jordan's Lock and puttering our way down the valley towards Homes Lock. At this point we were on our own as this is the end of the locks covered by the Tinsley lock Keepers. We wished farewell to Derek and headed off towards Ickles Lock passing the Rotherham Boat Club Marina on the way. Every time we pass Jordan's Weir I am minded of the ghost poem here. There is also an amazing story about Narrowboat Copperkins II that happened between Holmes Lock and Ickles Lock that you can read here. I remember as a child seeing all the industrial activity along the Ickles Lock to Rotherhan Town Lock section of the canal and river. Now that the steel industry has almost gone forever. Few of the buildings remain standing but those that do, are supporting a different commercial activity. I wrote a posting about this part of the River Don and canal in April last year here. Since then the canal side warehouse has been demolished. We soon pass through Homes and Ickles Locks and head towards the confluence of the canal, the River Don and the River Rother. It is only a short section of the River Don before we reach the Rotherham Town Lock. If you want to see something of the history in steel making in Rotherham and Sheffield a visit to the Magna Centre is well worth a visit. Just before we reach the lock on the left is the remains of the facade of the Guest and Chrimes factory. Guest and Chrimes were brassfounders and it was a place where my maternal grandfather once worked around the year 1920 as a "Pattern Maker". James Payne, owned a small factory located in Water Lane which runs down to the river at this point. 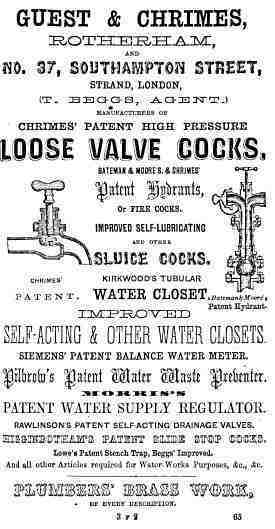 Peter Chrimes, who was a plumber in the town, patented an improvement in the design of water taps. The factory was eventually built for the purpose of manufacturing them, leading to the founding the world famous firm of Guest and Chrimes Brassfounders. 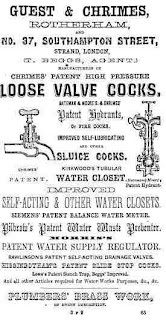 Among the principal products manufactured by Guest and Chrimes were, fire extinguishing apparatus of every description, hose couplings and general plumbers' and gas-fitters' products. 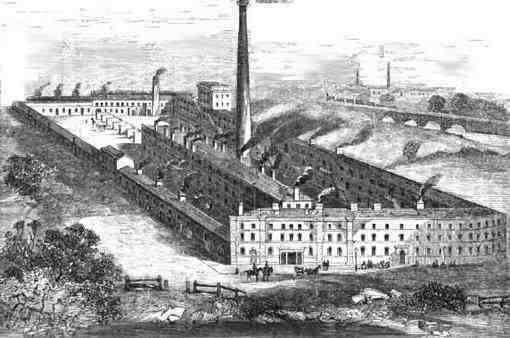 In 1861 about 300 workmen were employed, and the proprietors of the works had a branch warehouse in London. The Chrimes family took a serious view of their responsibilities and a deep sense of the obligations of their success that the business placed upon them. As head of Guest and Chrimes, Richard Chrimes displayed keen business nose which put his firm in the forefront and gained for it a world-wide reputation. He used his wealth for the benefit of others and he never forgot human infirmity or the poor. No individual or firm were more liberal in their help when appealed to on behalf of deserving and charitable objects. During the Franco German War in 1870, he subscribed large sums of money to the Red Cross Society. But what of the Guest side of the business. Rotherham’s historian John Guest, was born in May, 1799, and lived to the ripe old age of 81. He joined Mr. Chrimes at the brassworks and as a member of the old Local Board, he sought election as a councillor when the RotherhamRotherham, stating as his reason that he could never, as chief magistrate punish a man for doing what he had so often done himself. Extract from "Our Exemplars, Poor and Rich" by Matthew Davenport Hill, 1861. "Mr. John Guest of Rotherham, may be properly called a self-made man, and, in his locality, a public benefactor, being foremost in every social and benevolent movement that takes place in that neighbourhood. He is an energetic member of the Rotherham Mechanics' Institution. He was the first to introduce building societies into that town. He is a leading member of the Total Abstinence Society, a man of refined manners, of good literary taste, and, in his earlier years, was a frequent contributor, both in poetry and prose, to the local literature of this part of the country. He is an energetic sanitary reformer. Mr. Guest. possesses an extensive library, and a large gallery of good modern pictures by many of the best modern masters, including Reynolds, Gainsborough, Collins, Uwins, and the best men of the transition period. Mr. Guest's wife is happily a fit companion for a man of his taste and accomplishments; and many a cottage inmate in Rotherham and its vicinity may be heard to bless her name. She is a true sister of charity, benevolent and unostentatious. Without this couple Rotherham would be a wilderness." The factory site of Guest and Chrimes has stood empty and derelict for a number of years. However, recently "The Millers" (Rotherham United) have announced the old Guest and Chrimes site as the new stadium location. A football club statement said "The former Guest and Chrimes Foundry site has now been confirmed, this is an ideal site for our new home back in Rotherham, it will also provide significant regeneration benefits and leave a legacy for the future, not just for the Football Club, but for our town. The Council have played a pivotal role in making this happen, and we are very grateful for all their continued help and support. We have been working hard on the new stadium project behind the scenes for over 18 months now and have gained tremendous knowledge of numerous stadia throughout the country, and we have a good understanding what is needed for it to be a success for both supporters and to work for us commercially to provide financial stability for Rotherham United Football Club for years to come. Our town needs a Football Club to be proud of, playing in a stadium to be proud of, providing facilities for our community to be proud of. Make no mistake this is a significant day in Rotherham United's history and to say I am delighted for everyone concerned is an absolute understatement." By lunch time we had reached Rotherham Town Lock, this section of canal has two Supermarkets close by. Each is in easy walking and carrying distance. 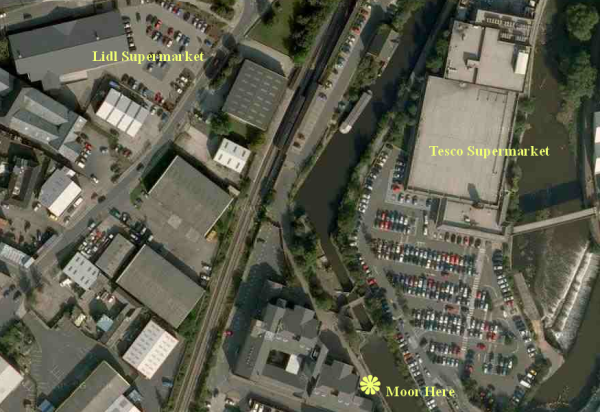 The first is Lidl which is on the left and the second is Tesco which is on the right next to the lock. 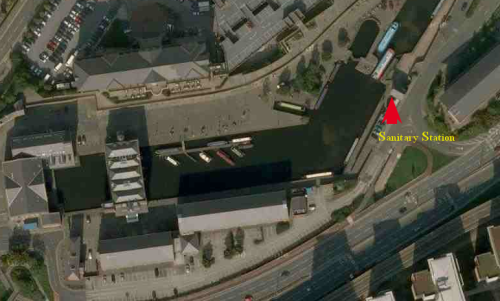 The main Rotherham railway station is also next to the lock At the side of the moored boat in the picture. Moor upstream of the lock, which is just outside the Police Station and Law courts so it is pretty secure and there is plenty of space at this point. Between The Rotherham Town Lock and Tulleys boatyard the bank has collapsed into the canal and is cordoned off with a line of bright orange buoys. We now head past Tully's boatyard and the point where the Humber Princess off loads her cargo of oil. It was at this point where I wrote some time ago about one of my ancestors who lost his life launching a boat on the canal. Our next stop is Eastwood Lock. Eastwood is the first of the Electric hydraulic powered automatic locks. We chose to take on some water at this point. However, the boat has to be in the lock to fill the tank. Can anyone else see why having the tap sited on the lock might be a bad idea. This is one of the Memsahibs favourite places to stop, because of the Parkgate Retail Park nearby. There is a long list of retailers here including Homebase, Morrisons, Boots, TK Max and many others etc. Depending on the weather, the time of day and what time the Memsahib gets back from her shopping trip. We either moor up here for the night or move along the canal to our favourite place to stay which is Sprotborough Lock. Tonight we are staying at Sprotbrough Lock.